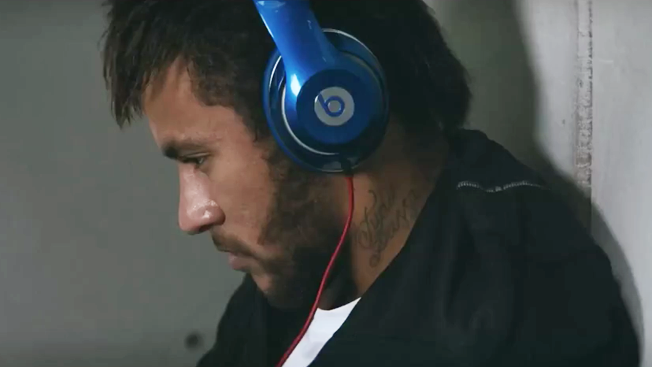 Beats by Dre may not be a sports marketer, but the brand certainly has the digital stamina to compete with Adidas and Nike in terms of YouTube views, highlighted in this week's Adweek/VidIQ top 10 branded videos chart. The five-minute "Game Before the Game" spot chronicles the pre-game rituals of soccer players like Brazil’s Neymar Jr., Luis Suarez from Uruguay and France’s Bacaray Sagna. Beats’ spot is one of three new videos to the chart this week and has racked up 5.65 million views, 63,200 Facebook shares and 16,400 Tweets. The video’s momentum builds on the buzz surrounding Apple buying Beats for $3 billion late last month. Half of this week’s brands are also running digital ads, per VidIQ, to promote the chart-topping videos, but interestingly, Beats is not one of them paying for viral. Meanwhile, World Cup spots from Samsung, Kia, Nike and Adidas continue to top the list of branded videos. The interactive infographic below lets readers watch all of this week’s top videos and see how much social engagement each clip received. Check them out.